Mark your calendar and save the date for this Saturday, July 13th. 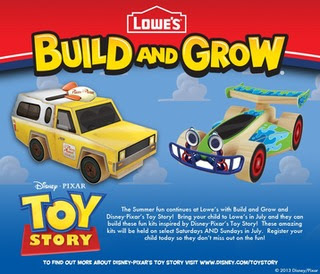 Stop by your local Lowe's Build and Grow Clinic and score a FREE Toy Story Pizza Truck. Don't worry if you can't stop by at 10am on Saturday, there's also a 2pm Build and Grow Clinic on Sunday at 2pm. YAY!